02-Apr-2019 Suntec REIT - Will UBS Park at Penang Road? Listed on 9 December 2004, Suntec REIT holds properties in Suntec City, Singapore’s largest integrated commercial development (including one of Singapore’s largest shopping mall), a 60.8% interest in Suntec Singapore Convention & Exhibition Centre, a one-third interest in One Raffles Quay, a one-third interest in Marina Bay Financial Centre Towers 1 and 2 and the Marina Bay Link Mall, and a 30.0% interest in 9 Penang Road. Suntec REIT holds a 100% interest in a commercial building located at 177 Pacific Highway, Sydney, a 25.0% interest in Southgate Complex, Melbourne, and a 50.0% interest in a commercial building to be developed which is located at Olderfleet 477 Collins Street, Melbourne, Australia. Its aim is to invest in income-producing real estate which is primarily used for office and/or retail purposes. 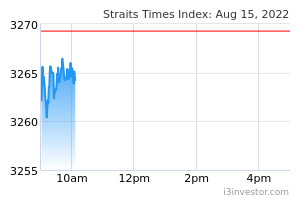 Suntec REIT is managed by an external manager, ARA Trust Management (Suntec) Limited. For more details, please visit www.suntecreit.com. steve84 Let's start comment here! TomYam Suntec REIT – Will It End The Strong Rebound? 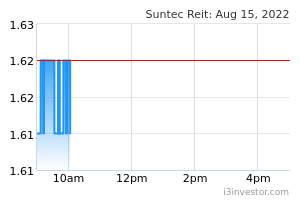 notlie Why suntec reit shot up today? weiboy90 Suntec Reit will be included in the MSCI Singapore Index @ SiMSCI, replacing Olam International. effective date is on 26th Nov.
chezball This reit has done well for me but i think they are facing a lot of headwinds on the retail front. Do see my qualitaive assessment of this counter after I have attended the AGM. MirageHotelPD Despite all the headwinds, Suntec REIT managed to declare higher DPU of 2.75 which is 10% higher compare to same period last year. With NTA 2.06, This is real good opportunity to collect and wait for recovery time. NicholasNWH90 Alvin you bought for capital appreciation and not for dividend?